In a landmark sale, the biggest in auction history, nearly half a billion dollars' worth of art changed hands last night at Christie’s sale of Impressionist and modern art. Soaring prices for blockbuster paintings by Klimt and Gauguin left thousands of spectators, who came to watch and to buy, gasping. "It was certainly the most amazing sale I've ever taken," said a dazed Christopher Burge, honorary chairman of Christie’s and the evening's auctioneer, after the two-and-a-half hour sale. The evening's total, $491.4 million, was well over $200 million more than that for any previous auction, topping its high estimate of $427.8 million. (The previous record was $269 million at Christie's in May 1990.) Of the 84 lots up for sale last night, only 6 failed to sell. That must mean our infinitely reproducable photographic "art" has _got_ to be worth 10x what we're currently charging. Gosh, what do they do, write checks? "what do they do, write checks?" From what I hear, if you're not already a customer of the auction house and known to them, then the auction house needs to make the acquaintance of your personal banker in advance of the sale. If you don't have a personal banker, well...suffice to say that people who bid on multi-million-dollar paintings ALL have personal bankers. John McEnroe, the retired tennis star, loves art but calls himself a "small time" art collector because his net worth is "only" $100 million. If memory serves, he said that paintings selling for $500,000 are his upper limit. Obviously you're never going to bid a large percentage of your net worth on a single work of art. 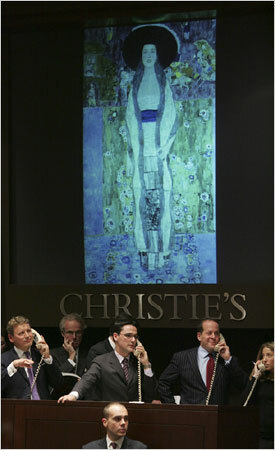 So people who bid $87 million on a single painting can be safely assumed to be billionaires if not multi-billionaires. This kinda cuts both ways: because, if you're a multi-billionaire and you've already got your yacht and plane and eight houses and whatever, what do you spend your money on? There aren't very many things you can buy that prove what a big cheese you are. That's one of the things that helps drive prices for paintings ever upward.